BERLIN (AP) — German conductor Gerd Albrecht, who led orchestras in the Czech Republic, Japan and Denmark and worked to bring music to children, has died, his office said Monday. He was 78. Albrecht died in Berlin Sunday evening following a serious illness, according to a statement from his office. It didn't elaborate. Albrecht was an advocate of contemporary music such as the works of Krzysztof Penderecki and Gyorgy Ligeti. 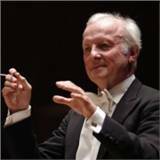 He served as general music director at the Hamburg State Opera from 1988 to 1997, a period during which he also served a less than harmonious stint as the first foreign principal conductor of the Czech Philharmonic. Albrecht led the Czech orchestra from 1993 until he resigned in 1996, blaming "political narrow-mindedness" following a dispute that underscored lingering tensions in Czech-German relations. He was appointed to help the orchestra achieve international acclaim but many Czechs bristled at the idea of a foreigner, especially a German, heading a symbol of national pride. Albrecht in turn complained to German media about his working conditions and accused Czech leaders of not showing enough support for his work. Albrecht served as principal conductor of the Tokyo-based Yomiuri Nippon Symphony Orchestra from 1997 to 2007 and led the Danish Radio Symphony Orchestra from 2000 to 2004. Albrecht, who was born in Essen on July 19, 1935, also wrote books for children and set up a foundation to help talented young musicians. He opened a Museum of Sound in Hamburg and launched a mobile music bus that traveled to schools.